Think comfortable living, think Smart Dholera Phase 1. A residential township facilitated by the most modern amenities, this project is being launched in the Greater Dholera area of Gujarat, specifically near the outskirts of Dholera SIR. Everything, beginning from the location of the township right down to the facilities it houses, is catered towards your comfortable living. So, if you have been looking for an opportunity to invest in real estate, now is the time. So why is the Dholera Bungalow the perfect place for you to settle down in? All the bungalows in the project have NA, NOC, and Title Clear plots. The location of the place is strategic. You will be able to access all the important points in the Dholera metro city from this residential area, including the proposed International Airport of Dholera. 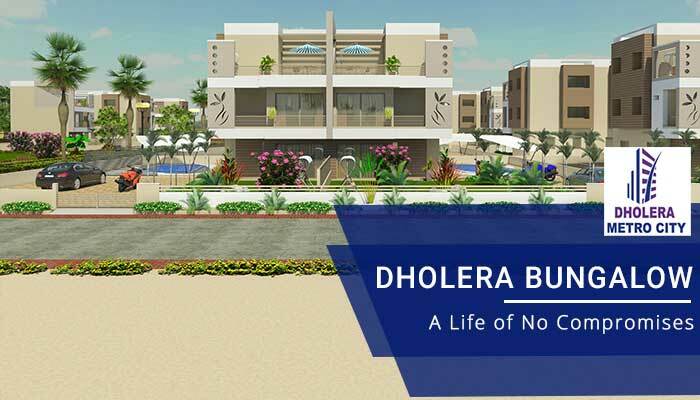 There are certain aspects of the Dholera Smart Project which make it one of the best residential projects in Dholera sir. You will have access to small plot sizes here, according to your needs. The plot sizes begin from 130 square yards. The locality and neighbourhood of the project are one of the most happening places in Dholera. You might even have some celebrities as your neighbours here. The proverbial Hotel Gallops is only a kilometre away from this area. You will have plenty of places to hang out and relax with your friends as Dominoes and Cafe Coffee Day are only at a distance of 1 minute from this place. You will also have access to 2 petrol pumps at a distance of 1 minute from the project. As mentioned earlier, the location of this place is strategic, and you will be connected to the various parts of the city through the 10 lane express-way, the metro rail, the International Airport, and the Delhi Mumbai Corridor. All these facilities are located at a distance of not more than 10 minutes from the project. Now that we have taken a look at the advantages of the project, let us now see what amenities you will be enjoying if you decide to invest in the project. No water logging during the monsoon season. These are only some of the amenities available currently. As the project develops, there will be new provisions added to make your life comfortable and smooth. If you book one plot now, you will get another for absolutely free. The EMI option will require minimal paperwork. With the availability of so many benefits, this residential project in Dholera SIR is gaining the attention of people everywhere. You too can invest in these properties and see them growing in the span of a year only!